Here’s a prediction; Italy will not win a game in this year’s Six Nations. Ok, as predictions go it’s not an especially bold one but if you fancy something as close to a safe bet as it’s possible to find in sport, lump every penny you have on the Azzurri making it three whitewashed Six Nations campaigns in succession under Conor O’Shea. Because despite all the emotive post-match words and the bizarre sight of their players performing a lap of honour after recording their 19th, yes 19th, successive Six Nations loss, on Saturday’s evidence Italy are in freefall. And perhaps worst of all, their dwindling band of fans know it. Fewer than 38,000 people, at least half of them Welsh supporters, were inside the magnificent Stadio Olimpicio to watch Warren Gatland’s below-par second-team cruise past the Azzurri with a great deal to spare. It was not a gratifying spectacle. Guilty of biting in on Liam Williams that left Adams go in unopposed for Wales’ first try. Enjoyed one strong run in the second half and did well to hold up possession when Ross Moriarty was on the attack. Rattled opposite man Adams with a soaring catch that put Italy on the front foot in the first half. One good run early in the first half came to nothing. Constantly looked for the intercept, to no avail. Fairly quiet as Italy looked to him to give them the hard yards. Looked lively on his wing with one clean break and a half-break in the first half. Saw a penalty effort on the stroke of half-time rattle the upright that saw Italy trail by five at the break. Took his eyes off the ball on more than one occasion that led to turnovers and could have provided more danger around the breakdown. Struggled initially in the scrum as Samson Lee gave him plenty of issues. Impressive at the lineout as Italy won 10 of their 11 set-piece throws. Adapted well in the front-row battle to get the better of Smith. Made a strong tackle in defence on Liam Williams when Italy were under the cosh. Good support for Steyn to help shove him over the line for the try. A useful option in the lineout under intense pressure from Wales at the set-piece. Impressive carry in the build-up to the opening try. Shook off a nasty fall from a lineout minutes later that gave Italy a shot at goal. Powerful surge brought the first try of the match as he rammed through the Welsh defence. Proved a nuisance when Wales were in possession, particularly with his hard-hitting tackles, and was a strong carrier throughout. Unlucky not to be named man of the match. Carried well as he attempted to set the tone for his teammates, but outshone by back-row colleague Steyn. Ran strongly in the lead-up to Josh Adams’ try. Did little wrong. A quiet Six Nations debut for the Leicester wing, but is challenging for a World Cup squad place. Chose the wrong option with a long-miss-pass that butchered Wales’ only chance to score a try in the first half. Captained Wales for the first time, and while he might be disappointed with the overall team display, victory was secured. Scored a second-half try as Wales made the game safe. A solid effort. Beaten in the air by Padovani for a cross-field kick and also sliced his own clearance effort that put Wales under pressure. Touched down for Wales’ opening try and was a threat throughout. Continues to grow in stature. Claimed an impressive catch off Aled Davies’ box-kick and reliable from the tee as he kicked 14 points as Wales dominated early on, but also made some tactical errors. Chose a risky option with a cross-field kick in his own 22 to Adams that put Wales at risk of a counter, and put a simple kick straight into touch and replaced before the hour mark by Gareth Anscombe. Worked hard at the heels of his forwards, and tried to give Wales impetus. Saw an early scrum advantage turned on its head as Ferrari won a penalty shortly before half-time against him. A quiet night for the Ospreys loosehead as Wales battled with the Italian pack. A hard worker in the loose, but his throwing into the lineout is an area that needs work. Will push hard for a starting spot against England, but needs an injury-free run. Not his best performance in a Wales jersey, but he remains an important part of the squad. Looked frustrated at times as Italy’s forwards gave as good as they got. Started strongly, then faded a little. Definitely one for the future. Six Nations debut almost produced a try at the end of an unspectacular encounter. Worked hard. Wales’ best forward by a distance. At the heart of all their key moments. These should be seriously worrying times for the Italian Rugby Federation who, like it or not, are only going to face more and more questions about their nation’s absolute right to participate in the Six Nations unless their team start competing soon. For the sake of this tournament, something needs to change. Because on all the relevant evidence the team who joined 20 years ago do not present serious opposition to the other five teams. Thirty-three defeats in 34 games against tier one opposition suggests Italy are no longer worthy of permanent status at the top table. Georgia, or whoever wins the Europe Championship (the top national tournament outside the Six Nations), should at least be given the right to compete in a play-off game with whoever finishes bottom of the Six Nations. For the foreseeable future, barring the odd freak result, that will always be Italy. If not, the tournament should be reduced back to it’s former five-team status. At the very least that would provide a tiny bit of breathing space in rugby’s horribly bloated calendar. If Italy continue to stagnate, the Six Nations will lose credibility as every other team picks a second-team to face them, just as Wales did again on Saturday. Sooner rather than later fans will twig they are being conned and vote with their feet, just as Italy’s did on Saturday. Perhaps when the bottom line is threatened, the suits will take action. Unquestionably, Rome is a magnificent, beguiling, moody and historic city and losing it as an away trip would be a significant loss for travelling supporters. Let’s not pretend Tblisi offers the same allure. Rome’s food is magnificent, the history and majesty of the city unparalleled while witnessing the distain with which some of Alitalia’s staff treat their paying customers really does need to be seen to be believed. But in purely rugby terms, if they still count for anything, Italy have lost their case. Every single English Premiership team, and most in the Pro14, would have beaten the Italian national team on Saturday and that is simply not the way it should be in a competition which must strive for continual improvement or risk losing its relevance. No-one doubts the effort of Italy’s players, the desire to be better or the willingness to learn, but the hard facts are now impossible to ignore. Italy are not good enough. For all O’Shea’s protestations, and goodness knows he is doing his absolute best, there is simply no evidence of progress. How many successive defeats are going to be needed for someone to say “enough is enough” Twenty? Thirty? Fifty? Wales, showing 10 changes and with four players who had never previously started a Six Nations game, barely needed to be better than average to win 25-16. The post-match mood was not lightened either by the strange decision by Italy’s players to perform a lap of honour, or indeed by the sight of former Roma striker Francesco Totti performing household chores in an apron while advertising washing-up liquid on TV in the press room, as O’Shea conducted his media duties. From an Italian perspective, it was pretty grim stuff. Scarily, this time next year they will almost certainly be without talismanic No 8 Sergio Parisse who has carried this team for well over a decade but who, at 35, is reaching the end. His heroic, magnificent career is not going to have a happy ending. Edoardo Padovani’s late try added gloss to the score-line on Saturday, just as the late rally against Scotland at Murrayfield the previous week provided false hope. 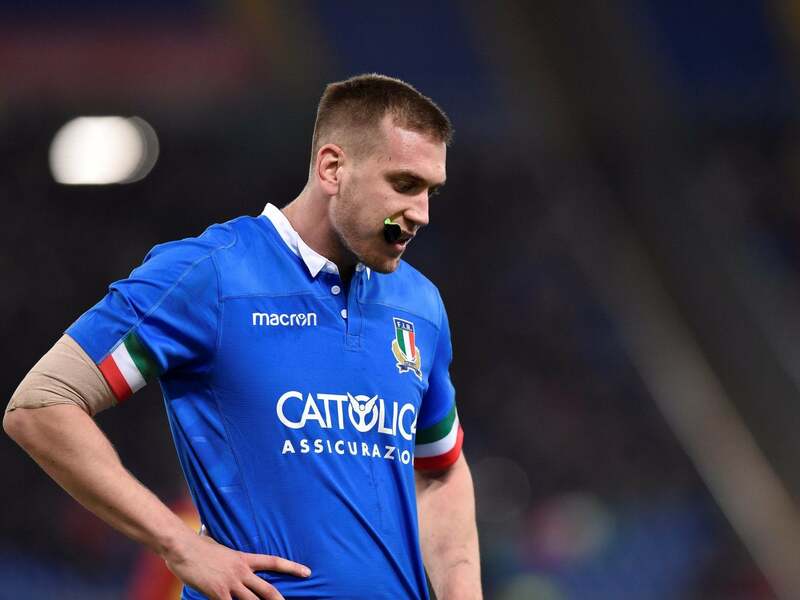 But with games against France, Ireland and England to come, Italy have missed their two best chances of face-saving victories in this year’s competition and yet another whitewash now appears inevitable. They are the tournament’s perennial whipping boys. For Wales, much more reason to be cheerful. They were not very good on Saturday but were still far too good for Italy. Their fans were unimpressed but coach Warren Gatland was playing the long game and finding out more about his squad by rotating his squad ahead of the World Cup. They have won 10 games in succession and deserve the plaudits for learning to win consistently, even if it was “ugly” as Gatland admitted on Saturday. Wales will be much better against England because can have to be and can be. Italy, on the other hand, despite some improvements from their two regions in the Pro14, are only going in one direction. It is time for us all to face up to fact Italy are no longer worthy of a Six Nations spot.